Willows are valuable for their colour and structure in the garden during winter and provide interest and shelter throughout the summer months. Most are shrubs or small trees and can be pruned to maintain a desired shape or size. Do not plant near drains or buildings. Cuttings are available in February and March for self-propagation. Mail order price £3.50, including postage, for each bundle of 6 cuttings. All cuttings are of 1-2 year old wood, please note that the thickness of the cuttings is due to the variety of the willow, and they are grown in the Highlands, therefore some cuttings may be thinner than you might expect. Golden stemmed willow with bright green leaves becoming bright yellow when planted in full sun. Slower growing than many willows, keep well pruned to maintain best shoot colours. Grown for its bright red or orange-red stems. Finely toothed green elongated leaves. Best pruned in spring to maintain colour on young stems. Twisted dark green stems bearing narrow, shiny green leaves. May suffer some dieback on twiggy growth, prune in spring to maintain shape. Fabulous winter silhouette. Narrow silver leaves, very slender upright shape, can be coppiced or pollarded to form a spreading conical tree/shrub. Very striking when in leaf. Strong yellow or orange-yellow stems (particularly on 2nd year stems) with sometimes brick-red colouring on exposed sides. Long, finely toothed mid-green leaves. Vigorous growth, cut back hard to maintain neat habit and stem colour. Strongly growing upright willow with polished dark violet, almost purple, stems. Shiny dark green leaves and silvery catkins. Can make a striking small tree. Glossy green and red-purple stems bearing shiny dark-green leaves with steely bloom beneath. Beautiful large, silky catkins flushed pink. 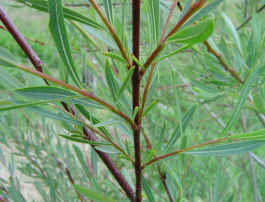 Olive green stems with shiny bright green leaves, forming a spreading bush to 3m high. Fabulous black catkins before leaves with red then yellow anthers. Polished black stems, with whitish down at their tips, bearing neat dark-green leaves often flushed purple when young. Tidy large shrub. Cut back for best stem colour. Glossy dark leaves are the striking feature of this large willow. Suits damp ground. Delicate arching shrub producing slender rose to purple polished stems, collecting raindrops after showers, and very narrow blue-grey leaves. Slim silver catkins. Stems good in flower arrangements. Bright yellow and orange stems with finely toothed green leaves. Pale yellow catkins. Will form a widely spreading tree. Cut back hard for best stem colour.